We can build solid privacy and semi-private fences, custom designed to accommodate a variety of residential and commercial needs. We can even create fences out of more than one material, such as a wood fence or cinder block wall with exposed or hidden iron. Call today for expert project planning assistance. Consultations are free and we give new customers a10% discount. A fence is often only as good as its gate, and we custom build incredible gates for our Palos Verdes clients. 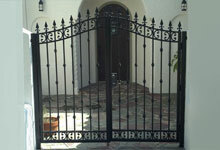 We use the same quality construction methods and materials for all of our gates and only use the most durable hardware. Additionally, with our in-house electrician, we can complete your gate installation with a gate access control system and/or gate operator. We are experts in: DoorKing, Chamberlain, Linear, Viking Access, All-O-Matic, Elite Gate, LiftMaster and more. The fence professionals at J&J Fence install chain link fencing for homes and businesses throughout Palos Verdes. 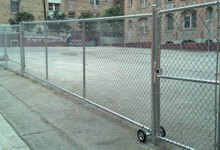 Our chain link is perfect for perimeters, tennis courts, kennels and more. Depending upon your needs, we can add strands of barbed or razor wire to your fence, privacy slats, or windscreens. Because of its versatility, long lifespan, and relative low cost, chain link is the ideal choice for many of our customers. Call today to learn more about chain link or cyclone fencing. A fence, window bar or handrail made of iron will never go out of style. 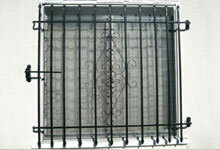 At J&J Fence, we specialize in ironwork. We offer ornamental iron, security iron and authentic wrought iron to the Palos Verdes community - all at highly competitive prices. Since we have been hand-forging iron into a variety of applications for over 30 years, we are confident that we can create the iron fence, window grate/grill/bars or handrail you are envisioning. Call today to schedule an on-site meeting. 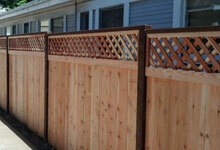 We have been fabricating and installing wood and vinyl fences in Palos Verdes since 1978. These types of fences are great for anyone seeking a classic picket, ranch rail, stockade fence or semi-private fence. Wood fences are affordable and have a natural appearance to suit any garden or property. Vinyl requires a bit more of an investment upfront, but creates a pristine-looking fence that is sure to last a lifetime with little or no maintenance. Call today to learn about all of our wood and vinyl fence options. Call J&J Fence today to schedule your free on-site cost estimate in Palos Verdes. We will give you honest and accurate pricing after we assess your landscape, take measurements and obtain a clear and complete picture of your fencing needs.